Continuing digitization has brought the businesses of many companies into the world of the Internet. The biggest problem the German car industry currently faces is the transition from the expiring combustion engine to the electric drive with digitized equipment. The classic product of the “vehicle” is transforming along with the Industry 4.0 slowly into an online service that encompasses the entire transport system. This change not only affects the major car brands such as Volkswagen, Mercedes, BMW, Audi or Porsche, but also the suppliers to the automotive sector such as Schaeffler, Continental, Leoni or Dürr. In the future, German car manufacturers are likely to be obliged not only to implement the technological change, but also to implement a change in the scope of services, and especially in the expansion of online services. In doing so, the country, which is famous for its mechanical engineering industry, faces the challenge of successfully advancing into the online world of digitization. Currently, investors on the German stock exchange do not seem to believe in the success of such a change, so that almost all German mechanical engineering stocks listed in the German leading index DAX had to suffer heavy losses in the course of the current year. This report will deal with the crucial question of how such a potential transition would be possible for Volkswagen and German companies in general. It will take all threats, effects and opportunities in account, and offer a solution concept for the entire German automotive industry. Thereby the Chinese industry will serve as a reference example, where future technologies are easier to implement, and a sound infrastructure for future technologies has already been widely established. In particular, the German car manufacturer Volkswagen is used to draw up a solution, as it operates in both countries, and has already taken various steps in the e-commerce sector. Volkswagen itself has an extremely ambitious goal for the future. By the year 2025, the Volkswagen group wants to become the world market leader for electric cars. The project is called “Roadmap E” for the e-car offensive. In the coming years, at least one variant with electric drive will be developed and launched on the market for the approximately 300 Group models. However, the “E” in “Roadmap E” does not only stand for the electric motor, but also for the online trade, that is, e-commerce. Customers should be able to put together their vehicle in the network and also complete the purchase there. So far, it lacks the latter: “The majority of the purchase decision is now taking place online, but for a complete shopping experience missing the test drive with the vehicle. Autonomously traveling boxes with panoramic glass windows will drive through the streets almost silently. Inside, the passengers are leaning back and relaxing on their way to their work place or office. Instead of an old-fashioned steering wheel is a novel computer in place, and a multimedia screen is entertaining them while driving. Traffic lights and traffic jams are an ancient thing of the distant past. The vehicles are driving in a synchronized and harmonious way without hindering or damaging each other. Thanks to a digital network, the vehicles communicate with each other and exchange traffic data, so that at intersections, the velocities of the vehicles, algorithmically matched to each other, enable a neat threading. In addition to passenger transport, in the same way products and certain services can be transported and delivered without the need of service personnel. These surreal pictures are not scenes from an upcoming sci-fi movie, but situations that could become reality in just a few years from now. Companies could commercialize this innovative system of transportation, expand the necessary infrastructure and offer it in large cities. The rapidly advancing urbanization as well as the aging of the population and population growth are causing traffic to grow rapidly and could push existing transport systems to their capacity limits. In German metropolitan areas and large cities, traffic volumes have increased. The passenger-kilometers per day increase with 3.2 billion linearly. Here, the increase in urban areas with up to 20% is drastic. This results in profitable business opportunities that could shape the future automotive industry. The use of smart technologies and disruptive product politics is forcing online transportation businesses, traditional car companies and automotive suppliers to either participate and adapt to these changes, or potentially run the risk of being driven out of the market, at least partially, by new entrants from the technology industry. IT-companies are currently also working on various methods to connect the cars in general, and make human intervention obsolete. According to a Continental study, about 52% of respondents in Germany are in favor of the introduction of autonomous driving, because it is expected to reduce the number of accidents. In China, however, the agreement among motorists for autonomous driving was 89 percent, and thus significantly higher. As a result, autonomous driving in China should prevail earlier than in Europe.3 More favorable regulations that support alternative propulsion systems and new intelligent mobility concepts can also help transform the industry. In doing so, companies can not only focus on the previously limited fields of technology, but must think in terms of a broader range of services. Various developing technologies such as Virtual Reality (VR) can also have an impact on the business model. Thus, VR can be used as a driver assistance system in form of a mixed reality implementation, or in later autonomously moving vehicles to entertain the passengers in form of for example augmented reality (AR). One of the currently growing business concepts is ride-hailing, which has attracted not only successful start-ups but also established global companies. According to Statista’s digital market outlook, extremely high ratings from ride-hailing vendors have seriously challenged traditional companies in the automotive and transportation industries. In fact, Uber Technologies, with a $ 62.5 billion business value4, was already in 2016 through General Motors, which has been in the automotive industry for more than 100 years and currently has to close production facilities. The German automotive company BMW has become the first international brand to acquire a license for ride-hailing services in China. According to reports, a start with 200 vehicles is planned for the end of 2018 in Chengdu. Shortly before, the Chinese group Saic Motor launched a similar ride-hailing concept. Daimler is also working with Geely on the planning of a ride-hailing service through a joint venture. Also other German automakers are interested in similar projects in China. A senior executive from Volkswagen announced that the German automaker is in a joint venture with Didi Chuxing in China to manage part of the Ride Hail service platform’s passenger car fleet and to develop “purpose- built” vehicles to contribute to Didi’s services. It was stated that the joint venture will initially serve a fleet of around 100,000 new vehicles for Didi, of which two-thirds will be vehicles of the Volkswagen Group. Similar projects are also being operated by other international manufacturers such as Ford Smart Mobility in China, which illustrates the attractiveness of ride-selling services in China. So far, the expansion of this type of service in the West has been limited to a few suppliers such as Uber, and is being pursued to a much lesser degree by car manufacturers. Another transport service operated both commercially and privately is car- sharing. Here, too, there has been a great trend in recent years, which has marked the industry with strong growth. 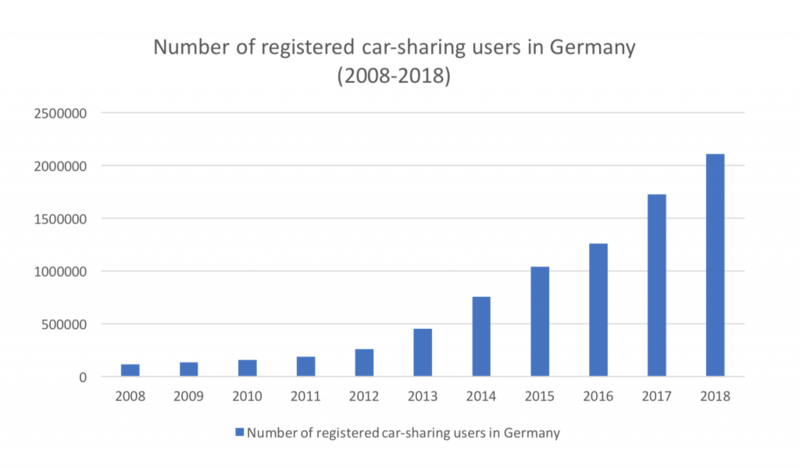 Carsharing according to German law refers to the organized joint use of one or more automobiles by multiple people on the basis of a defined framework agreement. Car sharing makes it possible, unlike conventional car rental companies, to hire short-term or even minute vehicles in a coordinated way. The costs incurred are composed of the useful life, and the consumption of the car. The private form of this new method, in which one shares his own private car among acquaintances and relatives, is also called private car sharing. Several German car manufacturers such as Mercedes have already adapted this service, which is the case with model series such as the new A-Class. Car manufacturers have been working on these kind of new e-commerce business models for years. With technological advances, the current battery technology enables the transition from the combustion engine to the electric drive. This can be better coordinated with computers, and allows new opportunities in transportation services, that are autonomously coordinated by computers. Therefore cars are becoming more digitized and intelligent as IT technology grows. Depending on the overall market developments, the German car manufacturer Volkswagen plans to build and sell up to 3 million pure electric cars per year by 2025. 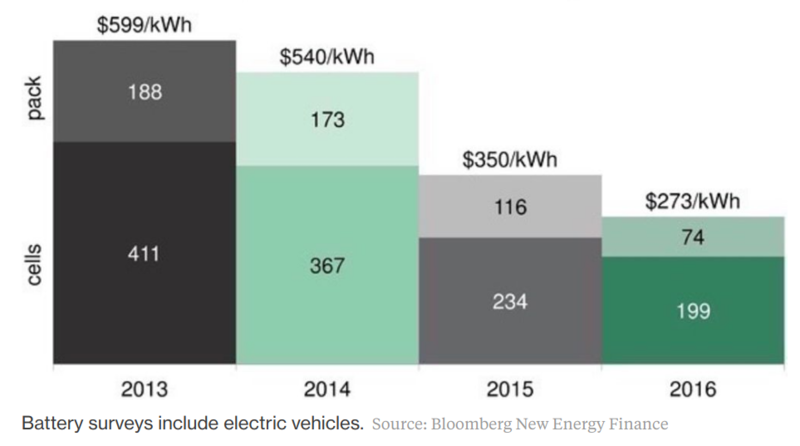 By then, more than 80 new electrified corporate models are expected to hit the market, including 50 pure electric vehicles. € 34 billion are planned for the future fields of electric-mobility, autonomous driving, digital networking and new mobility services by the end of 2020. In addition, the joint ventures in China to raise another € 15 billion for it. With the Volkswagen I.D. and the Audi e-tron, the company is planning on moving forward in the field of e-mobility. The disadvantage of the product change is reflected in the transformation of the broad labor market. According to the German Institute for Employment Research (IAB), the conversion from combustion to electric motors will make tens of thousands of jobs obsolete and disappear in Germany. In addition to the automotive industry, many jobs in the oil industry would also fall victim to the changes connected to e-mobility. Many politicians are therefore already under pressure because the introduction of e-mobility is causing the decline of various jobs fields. These effects are controlled and evaluated by the German government with support measures, and calls for considerate solutions to respective companies. Although there are currently no concrete measures for obtaining those jobs, one does not want to fall behind in terms of technological progress from a political point of view, which is why manufacturers and customers are being led to changeover through support measures. In addition to subsidies for the private sector, the German government also lays large sums of money (about € 100 million in 2016) for the electrification of state vehicles. In doing so, Germany orients itself to the concept of Norway and the Netherlands, where similar measures have already been successful in driving the energy transition in the past. Norway has the largest share of electric vehicles, where almost every third newly sold vehicle now has an electric or hybrid drive. As car manufacturers in Germany have their influence on political developments, such changes in the past have been slow-moving. Carsharing offers not only third parties the opportunity to run a corporate concept, but also the car manufacturers themselves. Mercedes and BMW are already planning a cooperation in car- sharing, and together they want to cover a large portion of the market at an early stage. The market for e-mobility and autonomous driving is estimated by UBS to bring significant business opportunities: By 2025, the annual potential electrification (excluding battery value chain) potential market is estimated at around $ 75-100 billion, compared to less than $ 5 billion Dollars today. For autonomous driving, UBS analysts expect a market worth at least $ 70 billion a year by 2025, or four times the current market size. The rental transportation market in Germany is characterized by strongly increasing competition from an increasing number of companies. In 1999, there were still less than 5,000 companies, compared to 470 in 2007. In 2007, the turnover of the sector was over € 16 billion. Of these, 55% were leases to companies, 17% to tourists, 18% to individuals and others, and 10% to accident victims. These numbers have meanwhile increased significantly. In 2016, the number of transport service providers rose to 36000, of which 26000 operate as taxi companies and 8500 as rental car companies. In the taxi and car rental sector, around 93,000 vehicles are used, of which 56,000 operate as a taxi, 36,000 as a rental car and 3,500 as a mixed-use vehicle. Every year 430 million passengers are served, which means an average of about 1.3 million passengers per day. The total distance traveled is 2.8 billion passenger kilometers, generating sales of € 4.2 billion. Another economic factor that has influence on the industry are state promotions of electric mobility in the business and private sector. Currently, many countries are promoting the purchase of an electric car, a fuel cell powered vehicle or a hybrid vehicle. With this promotion, consumers are in favor of saving on car purchases, and can make a contribution when switching to electro-mobility. The state support of an electric car amounts to € 4000, while hybrid vehicles are supported by € 3000. The aim of this aid is to help Germany achieve its goal of putting 1 million electric cars on the road by 2020, which is currently supported by Volkswagen. In conjunction with the low operating costs, the purchase of an electric car could be worthwhile from an economic point of view for the customers, and used by the manufacturers to their advantage. This advantage is met by companies in the energy transition through advantageous pricing for electric cars and complementing services. The development of prices in battery procurement display another factor that has great impact from an economic point of view. In recent years, a constantly falling price has been observed due to the worldwide expansion of production capacities. From the perspective of car manufacturers, this would lead to lower supplier prices in the medium to long term. Society dominates decision-making and strategy development in the sense that it dictates which services prevail and which technologies are accepted. So far, e-mobility has failed in part due to the low willingness and acceptance of buyers, while in the service sector car-sharing and ride-hailing offers are being used to a great extent. While in 2013 the global social average of willing people using ride-sharing services was 66%, the Asian region outperformed 81%. In Europe, the willingness to use this type of service was only 44%. However, many things have changed in recent years, and even in Germany, the number of users has risen. A new study examines the critical questions of what ride-hailing companies like Uber and Lyft are influencing people’s travel behavior in the western marketplace. It is referred to that these services attract mostly cyclists and pedestrians, and thus bring more participants in the motorized road transport. Research from the University of California and the UC Davis Institute of Transportation Studies has investigated major cities across America, and found that ride- hailing services, in addition to additional traffic, are also likely to increase the number of traffic accidents. Advancing technologies are also seen in the opposite context of a declining accident rate, which also carries weight. In many ways, due to the rapid increase, the necessary data is lacking broad conclusions as to the impact of online based transport companies from a societal perspective. Traffic researchers and city planners have so far been limited in their ability to gain insight into the precise timings and patterns of ride-hailing and car-sharing services and work out how the system can be thought out more carefully. It is clear that the services are widely accepted by the masses of large cities, and therefore currently serve a growing number of customers. There are two different ways of buying a vehicle that could happen in the distant future. The first option would be to use advanced simulation and VR technology to buy more vehicles online, which would lower the stock of vehicles at dealerships. The integration of the online and offline business of the German automotive industry has not been well received by most customers so far. Car buyers in Germany, China and the USA rated the combination of digital and real shopping experience as at best satisfactory in 2016, according to one study. Nevertheless, especially online enthusiasts were looking for a car dealership. Especially in Germany the connection to the dealer is comparatively high. Nearly half (46% of Germans, 43% of total respondents) of a study by Accent would buy a new car online if the prices in the E-commerce shop were lower than those at the dealer. But discounts are not the only thing that buyers would like to find on the net. Better product configurators, online chat advice and augmented reality applications are also on the list of the suggestions for improvement. The second option would be that in the future you will no longer buy cars privately, but only pay for the service. Thus, the private ownership of a vehicle through an ideal transport infrastructure would be superfluous. For the German society, it definitely makes a difference whether they buy a product or purchase a service of that product. “Ownership” stands in contrast to “Experience”, while especially in case of vehicles owning a decent car has its importance to a certain degree for some parts of the society. 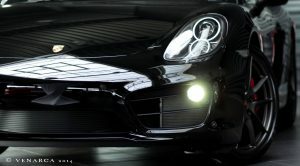 For example, sports cars and other luxury goods are more likely to be evaluated in terms of ownership and status. Some conservative motorists want do drive instead of being driven by an autonomous car. Early electric vehicle users will also face significant limitations in their living and working conditions due to immature charging station infrastructure, which also contributes to the strive for a common service that replaces the automobile as a single product. An investigation of the car-research center of the University of Duisburg-Essen examined the trend of car registrations over a period of more than 10 years. It came out that fewer and fewer new cars are registered by private customers. It shows that the Germans buy young used cars rather than new ones. The consequence is that the share of new cars in the vehicles of private users is becoming smaller and smaller, and recently at 2.9%. As a result, the average age of vehicles is also growing, to 9.3 years. In addition to technical development, social acceptance must be present for the implementation of a technology. Accordingly, many people currently tend to shy away from immature technologies. This can be seen in the rejection of electric mobility in general. In this case the Germans stick to proven products. This is the result of a wide ranged study by the German automotive supplier Continental. An overwhelming majority of more than 80% of the respondents in Germany and China, even more than 90% in the United States, would again choose the same type of engine when purchasing a new car as it is currently installed in the car they own. There is a somewhat greater willingness to change into new engine technologies in Japan, where at least just under 25% of those surveyed by Continental can imagine ordering a different type of engine when buying their next car. According to the same study, the results suggest that in younger people under 30, individual car use decreases to a degree. With the young age group in particular, a potentially long-term change in user behavior is to be expected. According to the study results, these do not always need to be their own car, and they can also be satisfied with “robotaxis” and ride-sharing instead of their own car. The distribution of cars in Germany is another factor that influences the social conditions in relation to possible benefits. According to a study of mobility in Germany (MiD), Germans drive at least one car per household. Every fourth household has two or more cars. In rural areas, 90% of households drive at least one car, while 40% even have two or more cars in operation. In the big cities, on the other hand, the proportion of vehicle owners is decreasing. This can be combined with progress in the transport services sector. According to the study by MiD, there is an overall increase in the private car fleet of private households. It is noteworthy that especially young people drive less and instead an increasing number of older people are traveling on the streets. The decline in car purchases is not a German phenomenon, but the case worldwide, and also in China and the United States. In particular, the Chinese market has a large weighting due to its immense size. The causes and reasons are still in their grounds. According to statistics from the China Association of Automobile Manufacturers, vehicle sales in November fell by 13.86% year-on-year to 2.55 million. This is the fifth consecutive month of decline in China. According to many analysts, the decline could be even more pronounced throughout the year as a high baseline basis was taken into account last December as a result of the rush to claim a purchase tax deduction. Total vehicle sales in China in the first eleven months were 25.42 million, a decrease of 1.65% over the previous year. These figures are so important to Volkswagen because the company operates part of its business in China and is well represented in the Chinese market. In addition to the uncertainty regarding the future of the automobile, other factors such as the trade war between the US and China, the growth in the service sector and various regulations also play a role. The ideal customer for a ride-hailing service is between 16 and 34 years old, and lives in an urban or suburban area. The gender distribution is uniform between men and women and the income in the middle range. This suggests that this type of service is used predominantly by young students with enabling financial support and young professionals. Since the place of use is predominantly located in urban areas, one could assume that it is used, among other things, for the way to the university or to work. Another assumption would suggest that the service is used for short trips within the city. However, it would be necessary to collect new data in order to confirm this. Another relevant factor that could be explored is the tendency to use ride-hailing services depending on smartphone usage. The reason older people are underrepresented in the customer base may also be because they are less able to use their smartphone. In countries like Germany, it is not uncommon for older people to have no smartphone at all, or just to use a regular mobile phone without an app function. The ideal customer for an electric car according to the German Fraunhofer-Institute for System- and Innovation-science is male and between 40 and 50 years old. He is well educated, tech savvy and has a good salary. He lives in the countryside or in the suburbs and he has one or more children. The second potential group are well-off retired people. Sophisticated comfort demands play an important role here. The third group would be younger people who could become early adopters. These are eco-conscious graduates who rely on a car. Currently, the price plays a big role in all three groups. There are also other factors such as infrastructure, range and charging time. One can conclude that predominantly people who are financially able to buy a slightly more expensive car, also tend to try a new drive technology. Because of this, the first electric-powered car, the Tesla Roadster, which boosted the early-stage electric vehicle trend, was priced at a starting price of $ 100,000 for the affluent businessmen in Silicon Valley. With the increasing commercialization of e-technology, the production costs sank and the cars became cheaper and more accessible to other segments of the population. In Germany, car dealers continue to value each other. Nevertheless, many German motorists are interested in new channels. 46 % of Germans surveyed would buy their next car back from a conventional dealer. 61 % would pick it up despite a purchase online at a dealer. 10 % could imagine buying the car in an online store. Chinese customers show the largest preference for “flagship stores” in the city center in the survey. Especially since the automaker Tesla came on this sales method for cost reasons, the trend has spread to many Chinese automakers. 37 % of respondents said they wanted to buy their next car in a flagship store. 28 % want to buy their car in a conventional car dealership. 15 % would be willing to buy their next car completely online. While many companies in China already have experience with comparable concepts for car- sharing (bike sharing, ride-hailing, etc. …), Germany is still a stranger to this type of concept. In addition, electro mobility is being much more strongly promoted in China, and novel concepts for the future are establishing themselves much faster. The German premium car brand Audi that is a sub-brand of Volkswagen has announced that it will invest just under € 14 billion in electro mobility, digitization and the development of autonomous driving by 2023.44 In similar investment decisions, other German automakers also show that they want to take the advancing e-mobility seriously, in conjunction with the possibilities of digitization and networking, and open up related business areas. Unlike the example of BYD, however, no German automaker has so far implemented e-mobility to a large extent in mass production, which is partly due to the low subsidies from the German state. Although the head of the German automaker Continental said that the company will decide its entry into the battery technology, regardless of state support measures, but this also indicates that the subsidies of the German state are not sufficient enough to invest carelessly in future-oriented business areas. Although the German energy industry has made great strides in the move towards green technology, and one has also pushed ahead with nuclear phase-out, Germany has been less ambitious in the automotive sector. In contrast, Chinese manufacturers such as BYD already operate large battery factories, and have quickly become one of the largest manufacturers of electric cars. This can be attributed to the large subsidies from the Chinese state, which at low sales quarters sustained the share price and the company itself. With increasing software and hardware technology, it is now possible to build vehicles with autonomous driving capacity. Many manufacturers such as Mercedes, Tesla and Co already have the first vehicles that have these capabilities, but still can’t fully use due to government regulations. To simplify the operation, more and more manufacturers rely on digital technologies for car keys. This makes many of the listed online services possible, as these types of keys can be easily assigned. So it is now common to operate a vehicle with a simple smartphone. The manufacturer relies on contactless Near Field Communication (NFC) technology, which enables the vehicle to be unlocked and started with the aid of a digital vehicle key. Since not all previous users possessed a smartphone with this technology, the manufacturers started to install the NFC controller in the vehicle, so that the Digital Vehicle Key is sufficient for the entire operation. Outside of the automotive industry, IT manufacturers such as Apple and Samsung have also devoted themselves to the development of these technologies. The legal factors for autonomous vehicles in general strongly correlate with the ethical question of how to prosecute a machine for the case of an accident. The responsibility for such a case is up to now with the controlling person, which is not present in case of autonomous driving. Thus, the vehicle controls itself, and is not a legal person that could be prosecuted for an accident. But before those laws are taken into account, todays’ online transport services struggle with another problem involving a regular driver. In Germany, transport service providers are subject to stricter laws than in other countries. Traditional taxi companies are being pushed out of business by new models, and are calling for a ban on these new business practices. For example, Uber’s service has been banned by rolling it up several times. In 2015, the Frankfurt district court first banned the German branch of Uber “UberPop” and the Limousine Service Uber Black nationwide. Car hire drivers in Germany may by law, unlike taxi drivers, not accept orders directly from the passenger. Uber responded with an alternative ride-sharing offer. The law was bypassed by e-commerce companies in the transport sector by combining the laws on rental cars and passenger transport. So customers could continue to book these services via app online. So far, ride-hailing and car-sharing service providers have, albeit to a lesser extent than in other countries, always found a way to keep their services on the streets despite unlawfulness. Flexibility is of great benefit to these online companies as conventional taxis are strictly regulated by law. For example, taxis in Berlin may only be kept at signposted taxi ranks for passengers. Exceptions are only between 20:00 and 6:00 o’clock and at public events. The market in Europe seems to be very important, according to LobbyFacts.eu Uber, which spent between€ 800,000 and € 899,000 on lobbying in 2017. The environment benefits greatly from the fact that a car-sharing system requires fewer vehicles on the roads than was previously the case with uncoordinated deployment. In addition, the nitrogen oxide output produced by internal combustion engines is eliminated. In addition, there is the possibility of minimizing the total useful life and number of vehicles in road traffic through thoughtful coordination as much as possible, thereby reducing the total energy consumption. Electric cars would generally be less harmful to the environment insofar as the energy to recharge the batteries is derived from sustainable sources. One potential environment-friendly technology would connect vehicles to the grid with the reverse principle vehicle to grid (V2G) that would allow them to charge their electricity back to the energy grid. These would happen during the peak hours in the afternoon, when most of the cars are parked, and the energy demand reaches its highest point during the day. In the later evenings the vehicles would charge back up, and get ready for their use. These would allow energy suppliers to use less those power plants, that are in need to satisfy the energy need during peak times. V2G would also shift the charging times to those points, where the energy is more likely to come from green sources. The annual savings from V2G are estimated at about $ 300 to $ 500 per vehicle. Not every business will be successfully transferred to the online world of Industry 4.0. Conversely, IT companies are currently tending to expand their businesses into the traditional sector due to the high profits of recent years. For example, Amazon is now looking to offline retail because they have already largely covered the online market. The automotive industry will continue to evolve in the future, and digital transformation will bring significant changes. Car manufacturers and dealers are still the most active sellers, but the risk of new entrants with potential for disruption increases as future car trading becomes more digital and convenient. Especially for companies that push forward into the IT world, there is the danger that sufficient digitization will not be available for sustainable existence. So many traditional companies fail against start-ups in that regard. There is a risk that the technology will be thrown out of the running by new companies that have positioned themselves more in the area. In China, for example, many companies such as Geely, BYD and now also Nio have established solid foundations in e-mobility, while many other Chinese companies are active in the service sector for the vehicles. In the United States, German carmakers are also outnumbered by the fact that Tesla and Google have spent years looking at autonomous driving, while German manufacturers like Volkswagen have no self- driving cars on the roads for a variety of reasons. These disadvantages of the German automotive industry could be fatal for Volkswagen in the wake of Industry 4.0, the energy transition and the future positioning of the automobile. In addition to the threats listed so far, Volkswagen also has problems left over from the past years. For example, one of the driving factors behind the energy transition in cars was the scandal involving exhaust manipulation, which forced Volkswagen to pay $ 14,7 billion for a settlement in 2015 in the United States. This was a wake-up call for many companies adhering to diesel technology and encouraged the switch to emission-free technologies. At the same time, 475,000 Volkswagen cars had to be taken off the road. Although the company has paid the majority of its problems caused by the exhaust gas manipulation on the American market, there are currently still pending procedures in Germany that could burden the company. On the one hand, the vehicle owners can claim large sums of money with a claim for damages, on the other hand, the shareholders who have lost their money by uncovering the scandal and the subsequent price drop on the stock exchange also want to be compensated. The latter group pleads that Volkswagen is guilty of having known about the manipulation without informing the shareholders. For this reason, different sites on the Internet are calling for signatures from affected shareholders in order to use them in class action lawsuits. In order to successfully establish itself in emerging online businesses, Volkswagen has to work on different fronts. On the one hand, digitization needs to be spurred on to a considerable extent so as not to be driven out of the race or outclassed by major global players in that field. At the same time, it is important to identify trends and market changes in car-sharing and ride-hailing at an early stage, and to address them in good time. There are already on the German market and internationally established providers of related apps and services, with which one could expand the partnership. If necessary, a completely separate service for reasons of coordination would be advantageous. For this, the acquisition of an existing provider would be worth considering, as this is not already overvalued due to the current focus. For a large corporation on the scale of Volkswagen, it would also be possible to influence the regulations in Germany politically in favor of such services. In return, Volkswagen could demonstrate the potential creation of many new jobs. Since BMW and Mercedes have already worked together in the service sector around car-sharing, it might also be advisable for Volkswagen to come together with a large car manufacturer possibly from China. This would strengthen the market position in China and possibly be promoted by the government. Since Volkswagen owns many model series and sub-brands, the group would not be dependent on a partner in terms of variety in the service sector. Therefore, it would be better to cooperate directly with a service provider. Another area that needs to be kept in focus is the digitalization of the sales structure. The low willingness of German customers to buy a car on the Internet, as listed on the previous pages, also prevents the car companies to move forward in this area. However, if properly implemented, Volkswagen would address a larger customer base. Volkswagen needs multi- channel distribution strategies instead of a three-tier distribution system divided into own distribution, wholesaler and dealer to address changing customer requirements around the necessary information for the sale. If buying a car really should become a multi-channel experience, then Volkswagen would have to fundamentally change the sales process. This is the only way they can take full advantage of the sales approach while fending off the competition from new companies whose platform business models are already dominating the used car market. So far successful manufacturers have had a clear selection in their assortment on e-commerce platforms with a small model portfolio. That’s why Volkswagen has to reduce the complexity of the model portfolio. From the geographical comparison between Germany and China, it can be seen that both the Chinese people and the Chinese government have significantly greater receptivity and support for future-oriented technologies and business principles. Here, it is advisable for Volkswagen to focus on traditional business fields in future- oriented business opportunities. Although it currently seems that the Group is doing enough, it has jumped on many technologies much later than many Chinese manufacturers.